According to the Business Insider, seemingly sick of Steve Jobs' control issues, Adidas has canceled a $10 million iAd campaign after its submitted campaign was rejected three times. It's not a first, however. In August, Chanel walked away after too much meddling by Apple with its creative. 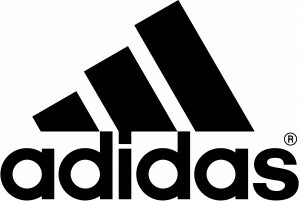 Adidas isn't commenting and neither is Apple other than to say it believes Adidas will still advertise on the platform. But Yahoo CEO Carol Bartz is commenting and she thinks Apple's going to be in trouble with it's strict stance on iAd acceptance. In an interview with Reuters, she said, "That's going to fall apart for them. Advertisers are not going to have that type of control over them. Apple wants total control over those ads." - Is the New York Jets situation with Ines Sainz just another publicity stunt? - Need to hype a stupid app that analyzes your poop? Take a shot of a chick with her tights down taking a dump in a stall. Yea. That'll do it. - The Lindsay Lohan Milkaholic law suit thing has ended in settlement. - Brooklyn creative agency Big Spaceship is out with new work for Microsoft. Called Always Beautiful, the "interactive music experience that uses the history of the web as a personal paintbrush" touts IE9. - Counter-culture princess Charlyne Yi has shed her hair and dismissed food to raise awareness for OxFam America. - For the Born HIV Free campaign and the Global Fund, YouTube is launching a campaign from Johannes Leonardo that will position 20 teams of campaign envoys at Manhattan intersections, holding signs with HIV facts that urge people to "free future generations from HIV by 2015." 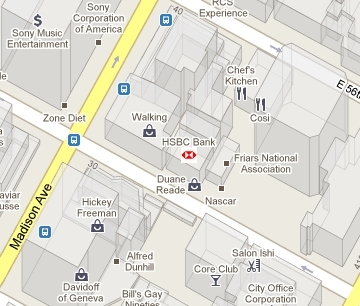 After a six month test in Australia, Google has opened up a new ad platform on its Maps product. Brands can place a logo on their locations within the application. The logos will replace the standard grey logos which already appear in the product. The program is rolling out initially with four advertisers according to Advertising Age. Bank of America, Target, Public Storage and HSBC have signed on for the beta period. Soon, all. 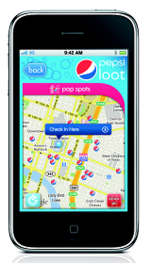 businesses will be able to claim their space on Maps. 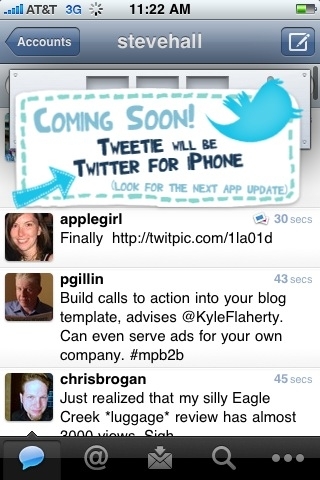 As you may have heard, Twitter bought Tweetie, an iPhone app for Twitter. It's a great app. Our favorite. On a recent Tweetie upgrade, one of the improvements listed was "a surprise." 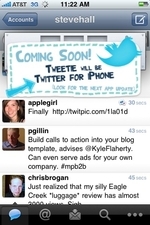 Well, the surprise is an ad promoting the fact Tweetie will be Twitter For iPhone. The promotion takes the form on an on-screen ad that appears when the page is pulled down to reload new tweets. The first time the ad appears, slot machine wheels appear and spin along with the message "play again." The second time the ad appears, a banner hangs for a few seconds with the message, "Coming Soon! Tweetie will be Twitter For iPhone. (Look for the next app update)"
Apart from the initial annoyance and what-the-fuckness of having a tweetstream attacked by an overlay ad, the ad format isn't a bad one. It's not overly annoying and, as a benefit to the advertiser, is front and center in terms of its ability to command attention. As we sit here, stranded and lonely, on a miserably cold and rainy day in a Doubletree hotel in Tampa, we'll take any form of excitement and warmth we can get. So when we saw this Valentine's Day sexting thing from Red Tettmer, we jumped at the chance for human interaction. Sadly, Red Tettmer doesn't care how stranded and lonely we are. Our texts to the nimble-fingered Red tettmer hottie went unanswered. What's a person stuck in a hotel room to do?